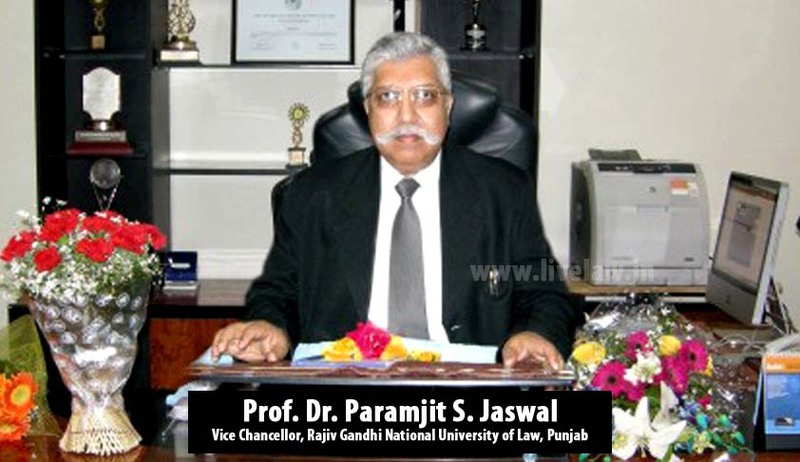 Prof. Dr. Paramjit S. Jaswal is the Vice Chancellor of Rajiv Gandhi National University of Law, Punjab. He is an academician par excellence with a vast and rich experience of 33 years in the field of teaching and research. He is a keen researcher with three decades of experience and has to his credit 66 research papers published in various reputed National as well as International Journals/Books. He has presented a multitude of research papers in numerous Seminars and Conferences and is also guiding and supervising LL.M as well as Ph.D. students. He has expertise in the field of Constitutional Law, Administrative Law, Human Rights and Environmental Law. Till date he has published/edited fifteen books on vital topics in Law. His book on Environmental Law, second edition (2003), is widely acclaimed in the legal field and has been cited thrice by the Supreme Court of India in the landmark judgement reported as In Re: Noise Pollution, (V) (2005) 5 SCC 733. Hon’ble Mr. Justice R.C. Lahoti, the then Chief Justice of India, had authored the judgement. Dr. Jaswal is a recipient of numerous Fellowship/ Awards and Scholarships. He was awarded Nehru-Centenary British Fellowship Award for the year 1991-92 for doing post-doctoral research in the Department of Law, School of Oriental and African Studies (SOAS), University of London, London, (UK); Career-Award-1994 for Young Talented Teachers by the UGC; and Bharat Jyoti Award in 2006. He has been a recipient of University, State Government; National and UGC Scholarships at different levels of studies. He has completed a course on Human Rights at the International Institute of Human Rights, Strasbourg (France), and also undergone an intensive training in International Centre for University Human Rights Teaching as well as Internship at the UN Centre for Human Rights (Geneva). He is also an able administrator and has handled various positions of responsibility in Punjab University. After serving as a Vice-Chancellor at Hidayatullah National Law University, he joined as Vice-Chancellor of Rajiv Gandhi National University of Law, Punjab at Patiala in February 2011. Live Law: Sir, while we were putting together your introduction we found, rather overwhelming, the accolades to your name in a span of 33 years. How would you describe the trajectory of your career and according to you, what was the key turning point in it? Prof. Dr. Paramjit S. Jaswal: The most important thing which happened during my studies is that I got excellent teachers and friends at every stage of my life. Live Law: Sir, would you like to comment on CLAT 2015 ‘Online Examination’ system? Prof. Dr. Paramjit S. Jaswal: This is a new experiment we are doing and we are hopeful that it will be successful. Live Law: Sir, there are several private colleges who do not have strict attendance compliance, while a Student of National Law University has to maintain a minimum 75% attendance criterion. How do you justify this as an administrator and why is the rule not applied uniformly to private law colleges as well? Prof. Dr. Paramjit S. Jaswal: Once there is a statutory requirement of attendance then it should be adhered to. I do not stand in favour of laxity on the part of private colleges/institutions. I cannot say anything on their behalf. Live Law: There are some private law universities which perform better than national law universities. Would you like to comment? Prof. Dr. Paramjit S. Jaswal: You can’t make such a general statement. But yes, I am in favour of competition regarding quality education and in this regards, NLU’s are doing good. Live Law: Sir, the Average fee at a National Law University is 1.5 lakhs, do you think that such a high fee is justified and is commiserate with the facilities provided? Further, is there any movement to consider providing scholarships to meritorious students who cannot afford such a high fee? Prof. Dr. Paramjit S. Jaswal: The fee charged by the NLU’s is commensurate with the facilities provided. Most of the NLU’s are self sufficient after the initial need money was provided by the Govt. In almost all the NLU’s there is a provision for merit scholarship to poor students. At least we do provide for it. Live Law: As a Vice Chancellor, what are the innovations you have brought to RGNUL since 2011? Prof. Dr. Paramjit S. Jaswal: Building of world class infrastructure, change in curriculum, use of ICT in teaching and focus on research and creation of congenial environment for study. Live Law: Sir, how do you manage to retain quality teachers at RGNUL, Patiala? What are your future plans to recruit highly qualified teachers? Prof. Dr. Paramjit S. Jaswal: I have been lucky. My best faculty has not left to join another institution. I have been providing all the facilities to attract good & experienced faculty, shall do the recruitment drive to attract good faculty. Live Law: What are the opportunities of placements and internship at RGNUL? Prof. Dr. Paramjit Singh Jaswal: Our students are doing internship with best law firms of the country and at other places. Our students are also getting good placement. Many joining the Bar as Litigation Lawyer-which is a welcoming feature. Live Law: Sir, what are the opportunities that are open to young law graduates after the five year integrated Law course? Prof. Dr. Paramjit S. Jaswal: There is no dearth of opportunities. They can join Bar, Law firms, Law Officers, NGO’s, JAG branch, Judicial Services, further studies and then teaching, then own business or even become authors of good law material. Live Law: Sir, which national and international journals would you recommend for students to concentrate on, in order to get papers and articles published? Prof. Dr. Paramjit Singh Jaswal: There is wide and open choice. It mostly depends on the subject matter and quality of your article. In India, ILI Journal or for that matter journals of each of the NLU’s are very good. At the International level, Harvard Law Review, Cambridge Law Journal, to mention a few. Live Law: Sir, what are your tips to aspiring students trying to get scholarships and fellowships (as you have been successful in the past)? Prof. Dr. Paramjit Singh Jaswal: Fix your goal, work hard and concentrate on your goal and with the guidance of your teachers and friends you will succeed. Live Law: Sir, what is your view regarding Student Exchange Programme between National Law Universities. Prof. Dr. Faizan Mustafa, Vice Chancellor of NALSAR Hyderabad supports such a programme. Is it possible for the growing national law universities to pioneer such an exchange programme? Prof. Dr. Paramjit S. Jaswal: Yes, I am fully in favour of it and our university is already doing it. I started it after I joined RGNUL. Live Law: Sir, according to you, what is the current goal of the National Universities? In an interview to LiveLaw Prof. Upendra Baxi said that he had visualized the purpose of National Universities “to produce soldiers of justice”. He further said that National Universities are not producing enough law teachers and there is isolation from all other faculties. What is your opinion on these issues? Read the full interview here. Prof. Dr. Paramjit S. Jaswal: I agree with Prof. Baxi in this regard. In fact on these lines, NLU, Delhi has already started one programme. Live Law: What social responsibility does a Law School have towards the society? What is the contribution of RGNUL in this regard? Prof. Dr. Paramjit Singh Jaswal: Each Law school has immense social responsibility. In RGNUL, we focus on preventive Legal and rather than on litigative legal aid. We have adopted two villages adjoining the university for this purpose. We thank for your time and wish you the best of health and happiness.